It appears, for the most part, Iranians stuck to plan and gathered in small groups of less than a couple hundred and spread throughout the cities. 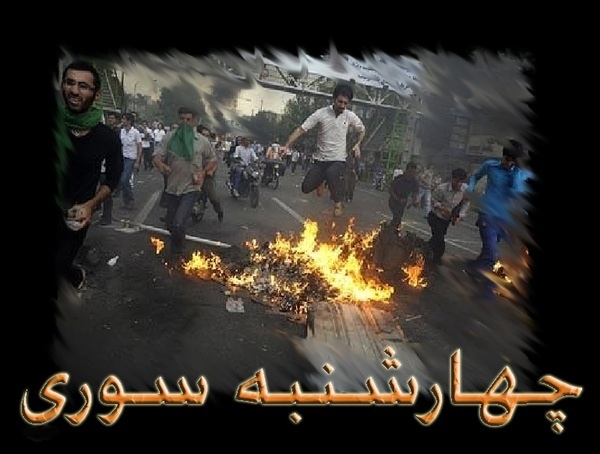 They burned pictures of Khamenei, Khomeini and Ahmadinejad, sang oppositon songs, led anti-regime chants, burned some police vehicles and Basij motorcycles, several clashes with security forces were reported and videotaped, and the opposition made their presence felt throughout all major cities and more. Based on eyewitness reports, in Ekbatan complex, despite checkpoints and tight control of the car and pedestrian access points to this area, the youth have made bonfires, and were consequently attacked by paramilitary forces resulting in eruption of severe clashes. Some reports indicate that people have lit a large bonfire around Seyyed Khandan bridge, and clashes have erupted between people and Special unit of the Police. Some media outlets have reported that one police officer has been arrested by other officers after he refused to follow orders on cracking down on people. Some other reports indicate clashes are taking place between basijis, Special Unit and people in areas like Geesha, Yousef Abad, Nezam Abad, Aryashahr, Tehran Pars, Rey, and Javadieh. Slogans such as “death to dictator” and “Canons, tanks, and basijis have no effect anymore” have been reportedly chanted by the people. 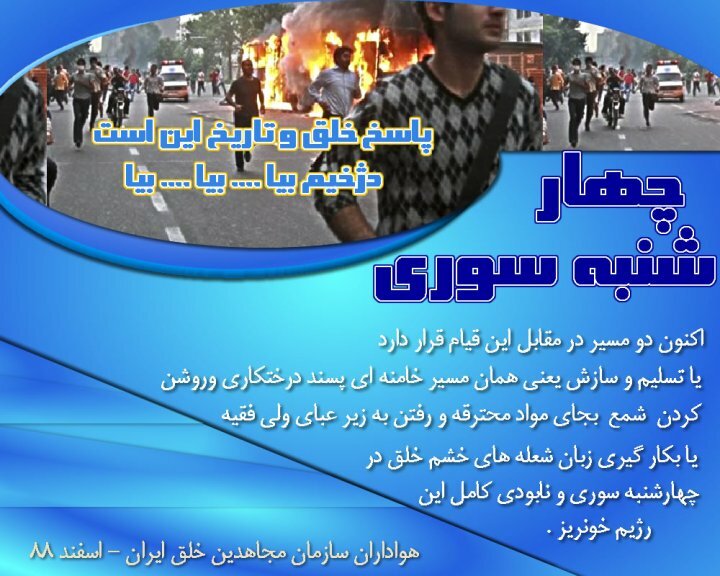 In several points in the city of Esfahan such as Chahrbagh Bala and Hatef Street, severe clashes have reported erupted between people trying to set Fire Festival’s bonfire and the security forces. 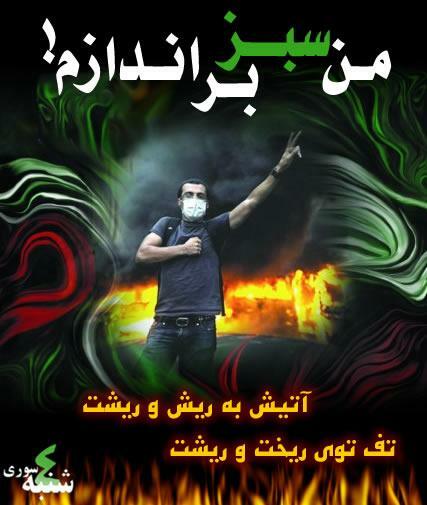 Some reports indicate that Basij kiosk in Hatef Street (Abdolrazzaq Square) has been attacked by the youth. Most areas in the city are under tight security measures. 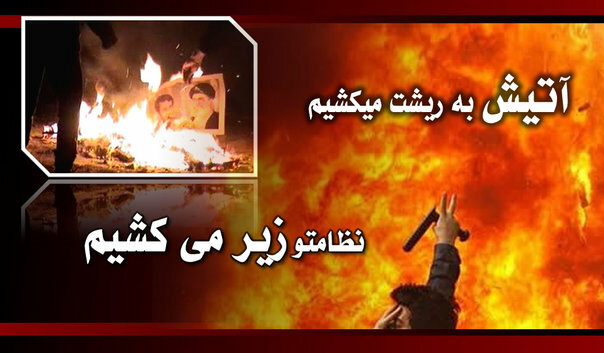 In spite of tight security measures taken, and display of posters in different areas of the city on the legal and religious ban of the Fire Festival, large group of people and youth have celebrated Chaharshanbeh Soori since the early evening hours. As a result, sporadic clashes have erupted. 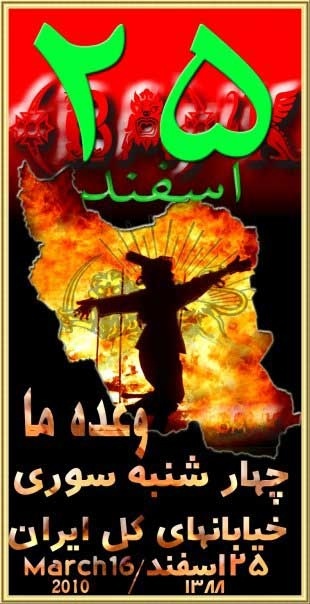 In addition, there are credible reports about celebration of Fire Festival in Orumieh (Northwestern Iran), Babolosar and Rasht (both in Northern Iran). No news on any possible arrests is yet available, and additional news will be consequently published once available. Youth set a police car on fire in Motahari street. 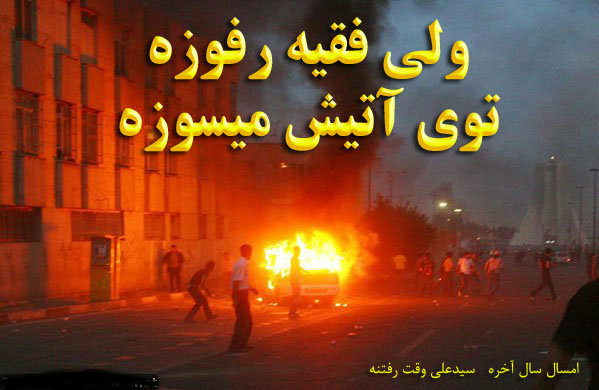 Tehran – 7 pm: In Motahari street youth set a police car on fire. The vehicle was surrounded by youth and then set on fire. A standby’s camera who was filming the incident was captured by the security forces. Orumiyeh full of smoke: Fire Festival unprecedented in the city’s history. Orumiyeh: Despite the presence of anti-riot forces, basij, and Revolutionary Guards in the city, people have gathered to make fires and use sound bombs. The city is filled with smoke. This year’s Fire Fesitval is unprecedented compared to the recent years. Protesters chanted slogans like “Death to Dictator” and “God is great” in alleyways. Orumiyeh is more crowded than ever and sounds of explosions and fire are everywhere. Ekbatan youth throw a hand grenade within one meter of Security Forces. 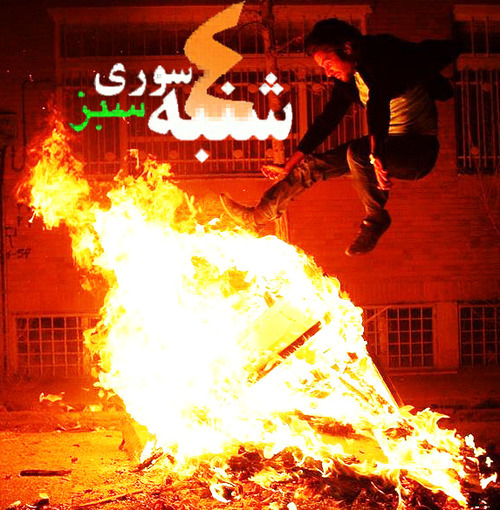 Tehran, Ekbatan: Ekbatan’s Third district was very crowded and people created bonfires and exploded home-made hand grenades¹ to celebrate the Fire Festival despite the tight security atmosphere. Youth were moving within one meter of security forces who throwing grenades at them. In Hafte Tir Square, people fought armed security forces with home-made hand grenades and fireworks. 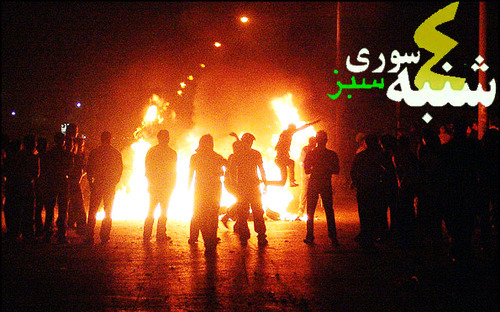 Tehran – 9 pm: In Hafte Tir Square, clashes are on rise. Security forces are fully armed and there are reports of gunshots. People are fighting back with fireworks and home-made hand grenades. Also Ostad Moyin’s street is very turbulent and people are all out. Around 7pm local time 10 brigades of the Police Special unit and 15 basijis were stationed in front of Nasr shopping centre. At around 7:45pm some of the forces attacked the people who had gathered there, and as a result people fled in groups of 50-100 to the nearby alleys. For some time, the security forces did not enter the alleys, but at around 8 pm, two military vehicles carrying around 100 forces entered the alleys, arresting four people whom they released shortly after. A young man reportedly threw a home-made grenade at the feet of one of the basijis. 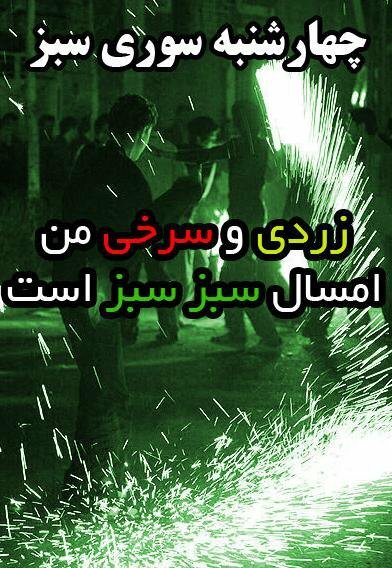 Based on reports received by the Human Rights and Democracy Activists in Iran, despite the strong presence of security forces in the city of Karaj (a suburb of Tehran), young [Iranians] launched Fire Festival celebrations using fire and rocket crackers. Since 8:00pm on Tuesday March 16th, people in Karaj flooded the streets in various parts of the city. The sound of firecrackers can be heard everywhere. The youth are throwing firecrackers at the police and intense clashes have been reported from the Azimieh neighbourhood between security forces and citizens. In some cases, the forces fled the scene. The security forces have been stationed in the main squares since the afternoon, and in some cases use their motorbikes to scare people. However, the very high number of people present on the streets has has immobilized attempts by forces. 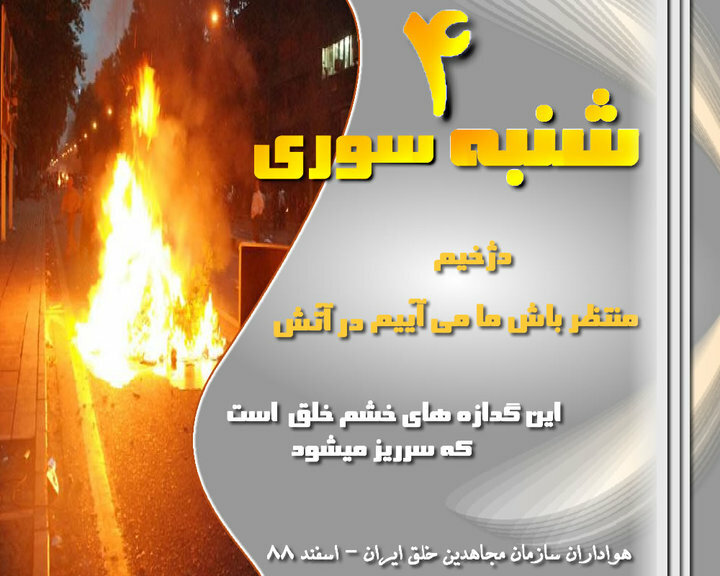 Daliran-e Bibak blog reports that youth in Vahidieh neighborhood have set the Basij headquarter in Baharestan Park on fire. 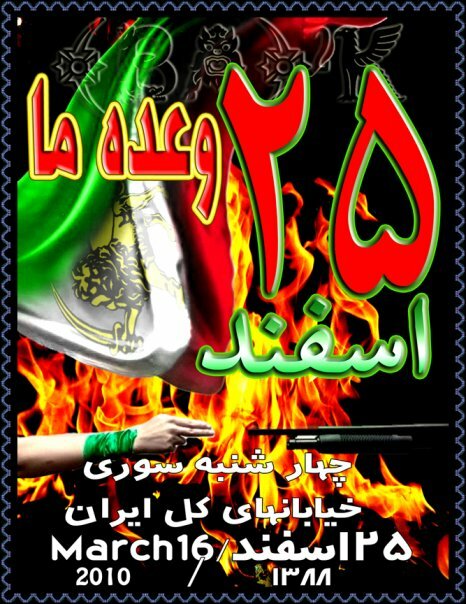 This basij centre had played a key role in cracking down on youth and protesters in the past. Moreover, the police have retreated from Baharestan park after closing down on and entrapping the youth present at this location. As a result, the young people have been able to join those outside the park. Noruz –March 21,2010- is the Iranian New Year, which is celebrated each year at the Spring Equinox, around March 21. The word Noruz, in Persian, means “New Day,” and the primal origin of the festival is in the universal rhythms of Earth and nature. In the “temperate” zones of the Northern Hemisphere, including Iran, the spring equinox signals the beginning of warmer weather and the growing season. In ancient Iran, it was the time to begin plowing fields and sowing seeds for crops. The equinox also marks the moment when, in the twenty-four hour round of the day, daylight begins to be longer than night. 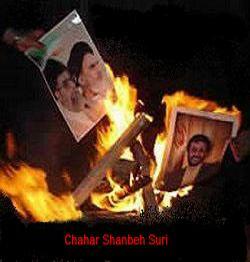 On the Wednesday before Noruz, Iranians celebrate a holiday called Chahar Shanbeh Suri – March 16, 2010. This means “Red Wednesday” in Persian. The red refers to fire. On the evening of that day outdoor bonfires are lit and the more agile members of the community leap over the flames. 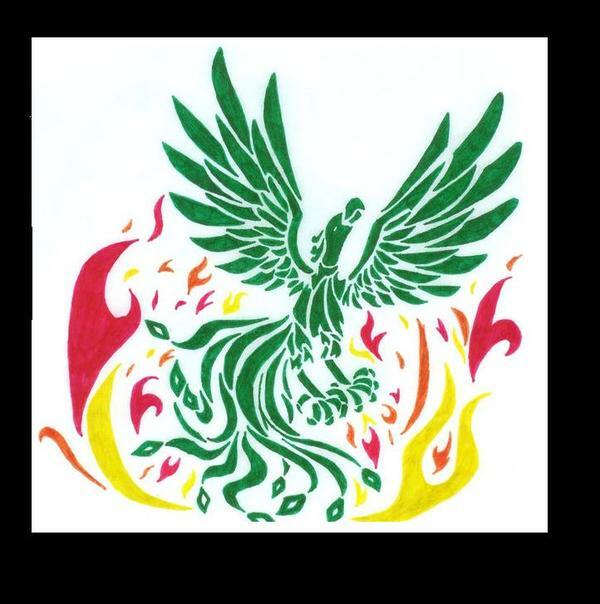 With this leap they recite: “My yellowness is yours, your redness is mine,” thus hoping to send ill-health (yellowness) into the fire and absorbing “redness” or good health from the fire. These bonfires are also said to burn away the bad luck of the old year. 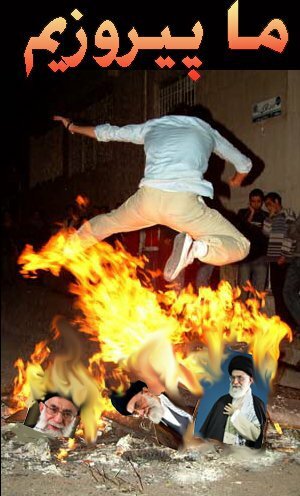 For most of the first and second decade of the Islamic revolution, people couldn’t celebrate Chaharshanbe Suri in public as dancing, boys and girls meeting, and any such so-called “deviant” behaviour was prohibited in the Islamic Republic. The situation changed when reformist president Mohammad Khatami took office and relaxed social and cultural restrictions, giving people the chance to revive Persian culture. 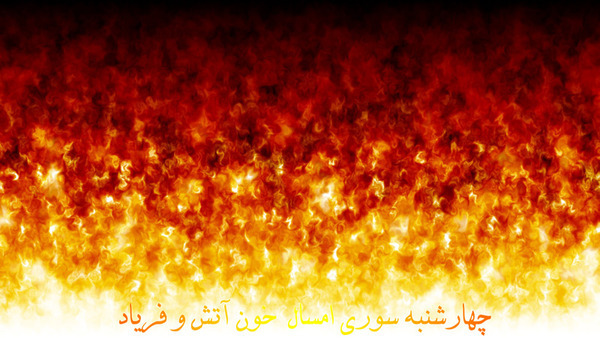 Since then, participating in Chaharshanbe Suri has also become a sign of protest and dissent against the Islamic Republic’s restrictions of Persian culture, as it’s the only time of the year when people can go out en masse and show their presence without any excuse and the government can hardly stop it. The gag released by Khatami has been tightened under Mahmoud Ahmadinejad’s government, and the huge presence of riot police and army all over Iran last year showed their willingness to do that. 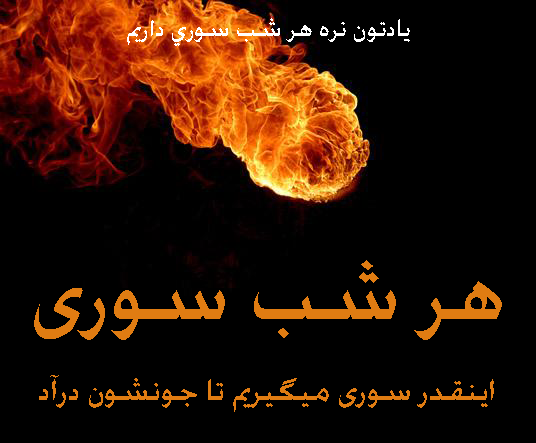 Chaharshanbe Suri is now a nightmare for Iranian officials. The festival has been given a new definition and a new function as a gigantic annual anti-government demonstration. 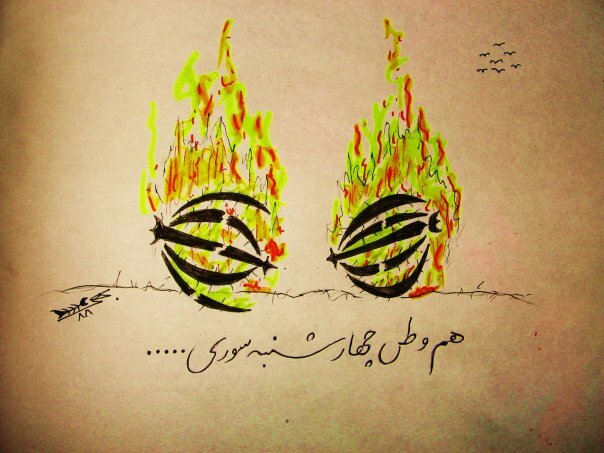 Fire is now a symbol of Iranian anger over the Islamic Republic’s restrictions. 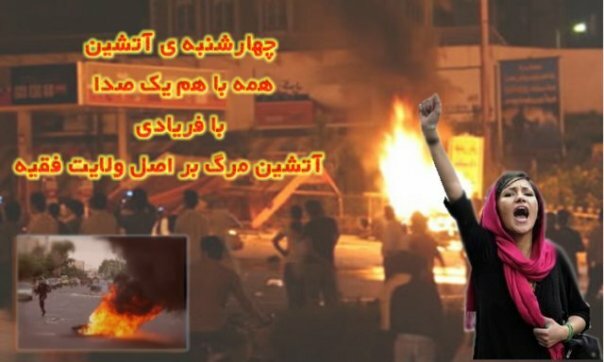 Last year, hundreds of thousands of Iranians threw Molotov cocktails and firecrackers in the streets to show the government their wrath, instead of lighting bonfires and jumping over fire and celebrating a traditional festival. 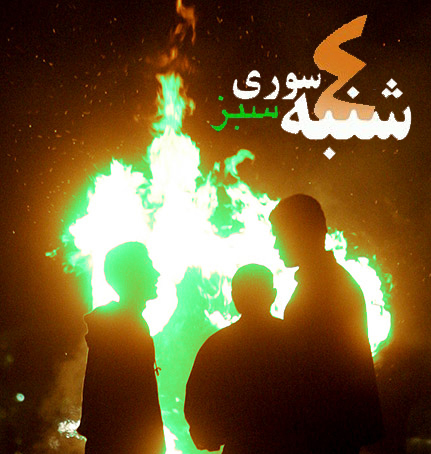 Chaharshanbe Suri has become the country’s most controversial cultural event, where many people suffer terrible injuries in conflicts with the riot police or while making Molotov cocktails or firecrackers in their homes. 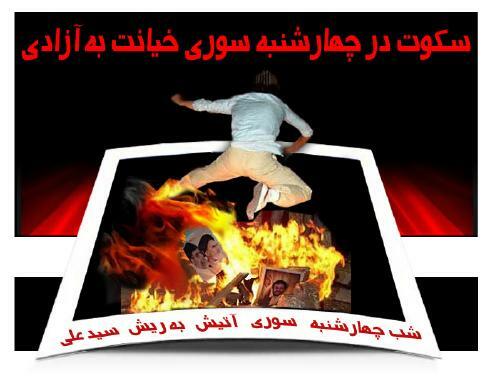 There is much debate as to whether the opposition should use Chaharshanbeh suri as a protest to the regime, as there are always many deaths, injuries and property damage as a result of the fires, molotov cocktails and fireworks. The cause of contention is that the regime will blame these incidents solely on the opposition, and that they will show on state television, the many burned, mamed or dead and air interviews with their loved ones in hopes of fostering division and anger towards the protestors. 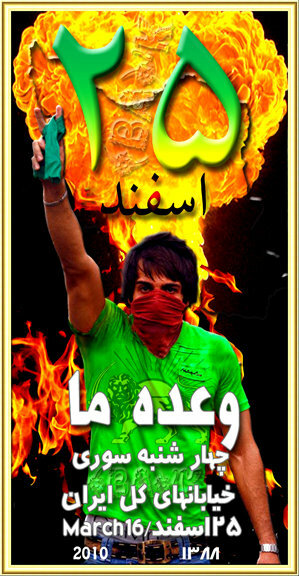 Many believe that the regime will lay blame on them anyways, and are determined to give the regime hell this night. 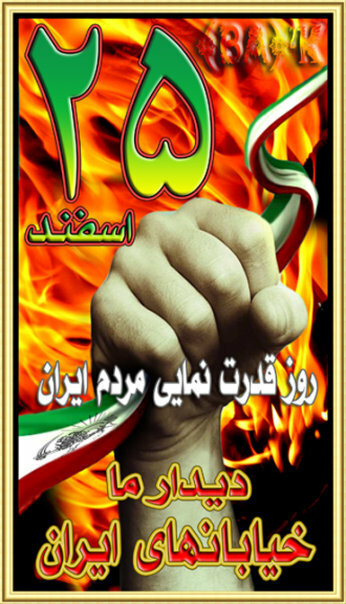 As evidenced in the above article, Chaharshanbeh suri has been used as an anti-regime protest since its rebirth during Khatami’s relaxation of the event. And since Ahmadinejad’s government crackdown on the event over the past several years, protests on this night have become more radical. Add into the mix, this years fraudulent election and crackdown on the opposition, there is the potential for a firey showdown. Taking into account what has transpired this past year, it is not realistic to expect many in the opposition to stay home and celebrate quietly. We agree, that the oppositon will be blamed for all the mayhem that will surely unfold, and perhaps it would be better to hold the protests on Sizdah Bedar when the people can congregate in the parks in large numbers. But, we must be realistic and acknowledge the obvious, and that is, there will surely be a large segment of the opposition that will engage on Chaharshanbeh Suri. We would hope and pray that they limit their activities to burning symbols of the regime (banners, posters and signs) and limiting property damage, as fires could spread and innocent lives could be at risk. Whatever decision they make, we firmly stand with them. *For those who will stay close to home and celebrate, we would encourage the tossing into the fires, pictures of regime figures and symbols of the regime (emblem from flag, etc. ), along with anti-regime chants. 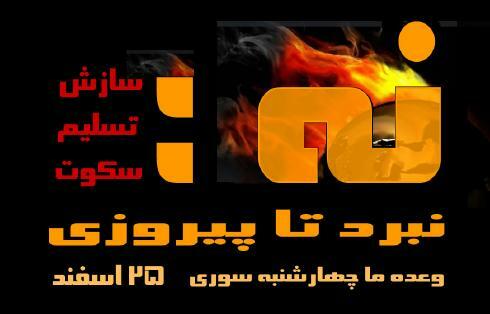 As more information on protests for Chaharshanbeh Suri and Sizdah Bedar become available, we will post immediately. Please pass along all info to family/friends inside and out of Iran, and help us add some more successful building blocks on the road to freedom. As always, stay safe and stay focused. he warns that on Chaharshanbeh Suri, celebrations must be confined to one’s own premises (stay near your house!) and that the police will act with full force if anyone tries to create disturbances. says police have to be prepared and alert as streets will be crowded for the shopping excursions during the holiday season. (apparently, worried about possible spontaneous protests). 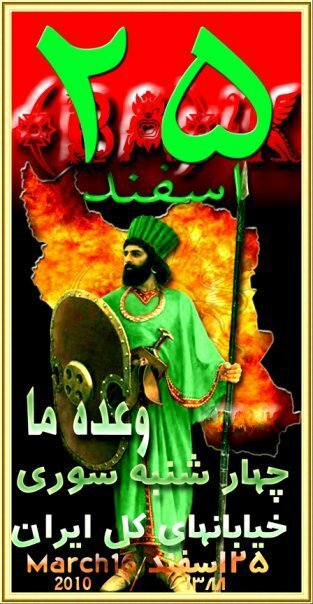 Also, he says they need to be prepared to the very end of Noruz, “we must be on our feet to the very end of the Noruz holidays.” He means, to include Sizdah Bedar. After meetings with IRGC officials it was decided that Basij patrols would be assigned to neighborhood watches across the country, according to deputy police chief Ahmad-Reza Radan. Radan explained that the measure would be taken to ensure the safety of citizens and their property during the Nowruz holidays when many homes are empty in different cities. 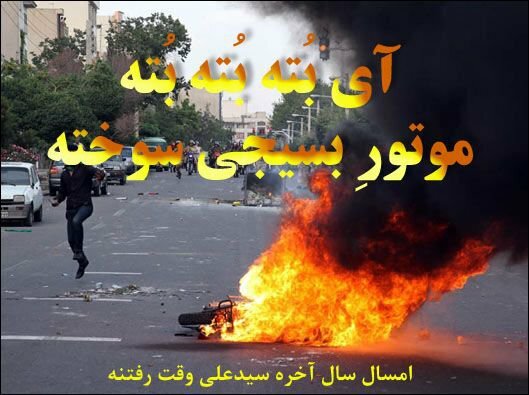 Groups of Basij will be patrolling neighborhoods on motorbikes – This is a great opportunity to create chaos and confusion for them under the cover of darkness. Creating oil slicks on roads with cooking oil, nails twisted together and bent outward as spikes in the road to flatten tires, etc. will keep them frustrated and on the run the entire night. They could also be led into traps through diversionary tactics and their motorcycles confiscated and set ablaze. 1- maintain the discipline of nonviolent struggles. 2- Create a traffic jam and horning at 6 PM. 3- Getting dispersed at different neighborhoods and impede the Regime from confronting the protestors at pre-determined locations. 5- Moving to other neighborhoods at 10 PM and starting a candle vigil in the memory of martyrs if possible. 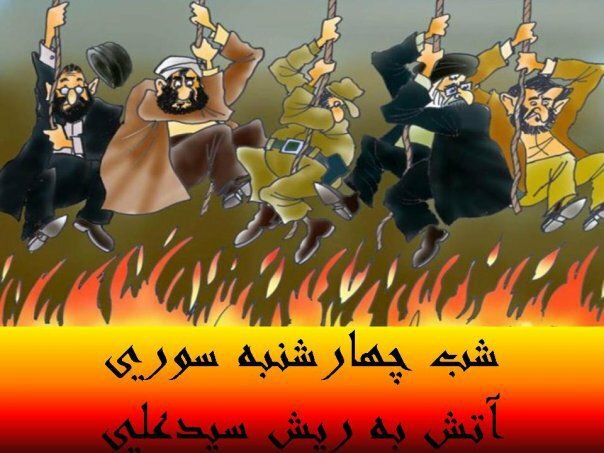 In anticipation of confronting the religious dictatorship ruling Iran, the Iranian people are preparing themselves to celebrate the traditional Fire Festival (March 16) or Chaharshanbeh Souri, an occasion widely expected to see protests against the clerical regime. 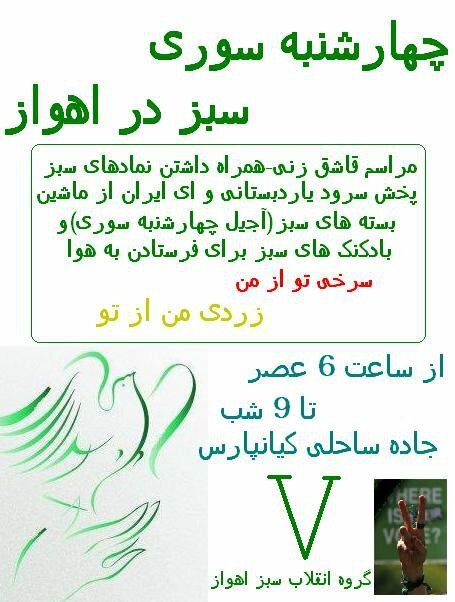 People in Tehran and the provinces have started preparing for the event several days ahead. During the past several nights, despite heavy security presence meant to intimidate the population, sounds of fireworks are heard in various parts of Tehran. The suppressive State Security Forces (SSF) vehicles patrol the streets, where they are greeted with the youths’ hand-made fireworks grenades from rooftops. 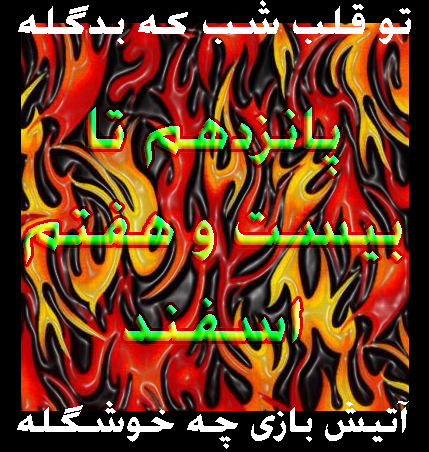 In the southern city of Shiraz, the sounds of fireworks grenades exploding are heard in various areas. 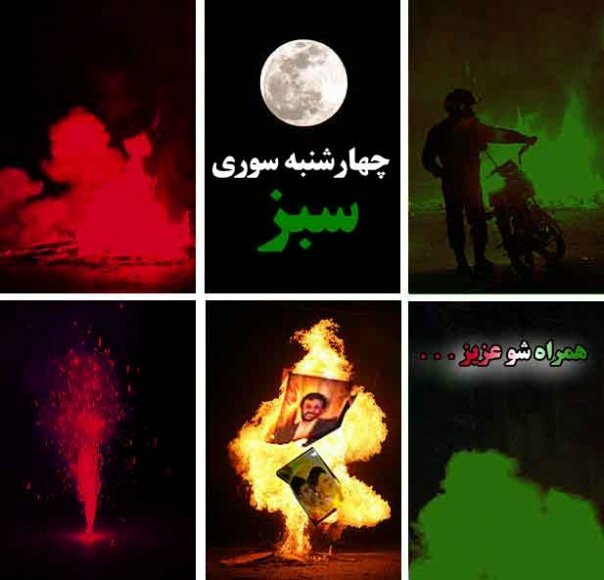 In the central city of Isfahan, youths sarcastically compared their use of fireworks and explosions to a military exercise on the occasion of the Fire Festival. 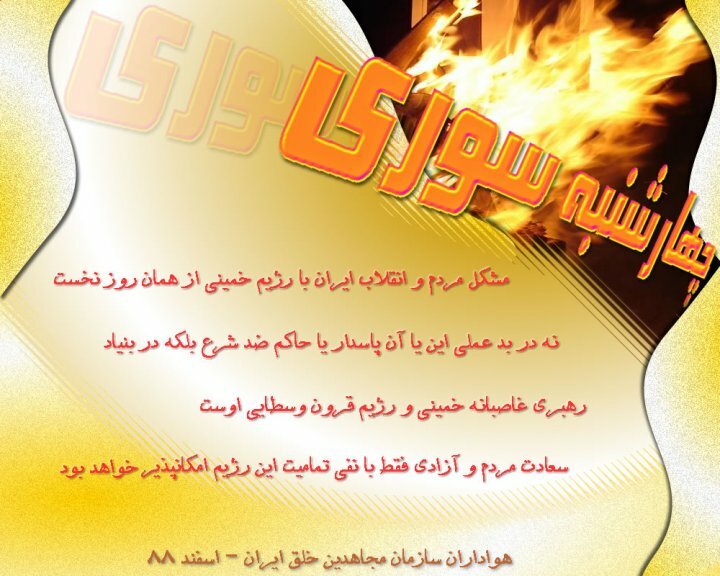 The city of Jiroft’s Friday prayer leader, Ali Zadsar Jirofti, described the Fire Festival as a leverage against the regime, saying: The opponents are planning to turn the Fire Festival into a leverage against the establishment. While linking the ancient Fire Festival to the foreign countries, he added: I think this year’s Fire Festival has a particular political overtone such that there is training for rioters on the internet and satellite TV channels, and they have put the creation of riots and destruction of public property during Fire Festival as their top priority. The SSF Commander, Sajedinia, said that 23 millions or some 80.000 kilos of hand-made fireworks have been confiscated thus far. He warned: This will definitely continue in the days ahead. 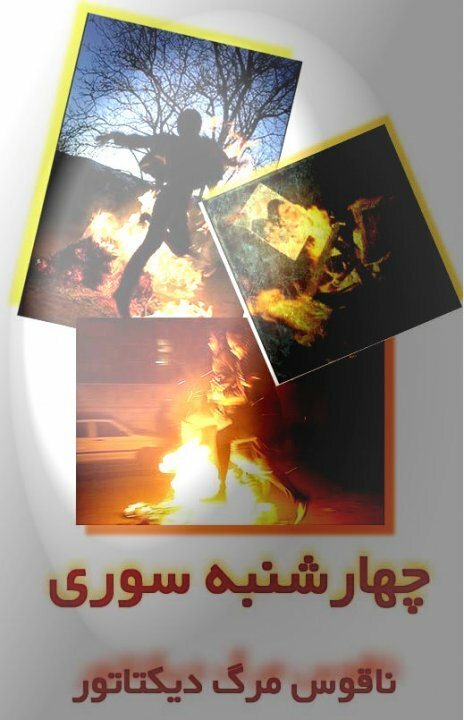 The Iranian regime fearing another mass anti-regime uprising during the annual Fire Festival celebration (Chaharshanbeh Souri, March 16), has given special guidelines to its repressive forces to prevent participation of students in the festivity. – Summoning parents of students to schools to put pressure on them to prevent their children from going out on the day of festivity. Regime’s authorities are warning them that if their children were to be arrested, they will not be released until the last day of Iranian New Year holidays in April. – Members of Bassij force in schools have been told to write essays about the dangers associated with Fire Festival. 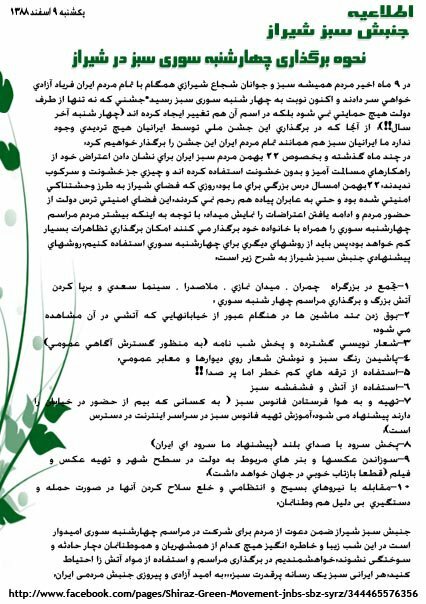 Prizes will be given to 150 Bassij members for writing such essays. The state-run radio and TV station have been ordered to broadcast series of programs with the theme of “enlightening and warning” families and the young general in the run-up to Fire Festival. To this end a 90-minute program has been recorded that shows the dangers of fire crackers and Fire Festival ceremonies in addition to another 30-minute program that introduces the Fire Festival in a way approved by the regime. 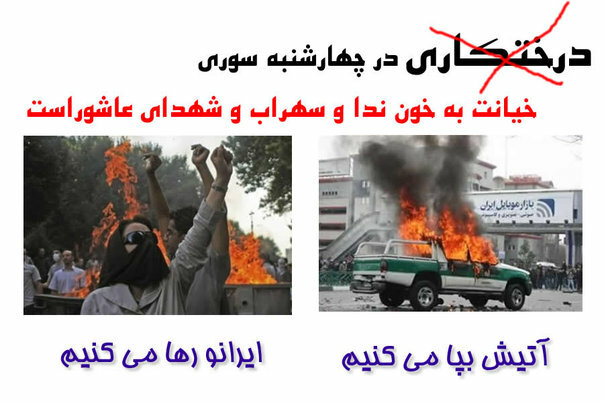 These two pieces are going to be shown widely by various TV channels, which are all run by the regime. 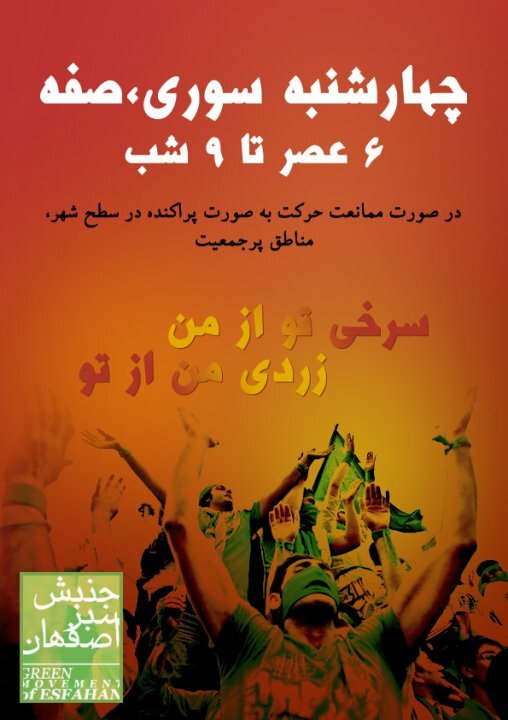 The Iranian people, who have revolted against the clerical regime are not going to be intimidated and lured by such ploys and are going to continue with their uprising by chanting “Down with Khamenei” and “death to the principle of velayat-e faqih (absolute rule of clergy).” They are going to continue with their display of hate and rage at the entire religious fascism ruling Iran. 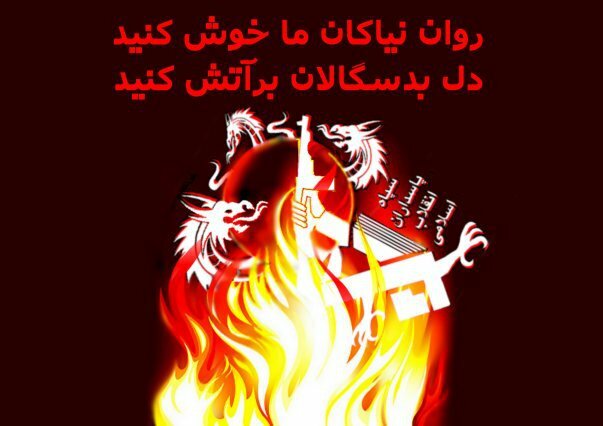 In addition to extensive suppressive measures in cities across Iran, the mullahs have resorted to psychological warfare and deceptions on the internet to clampdown on dissent during the upcoming Fire Festival (Chaharshanbe Souri) celebration. 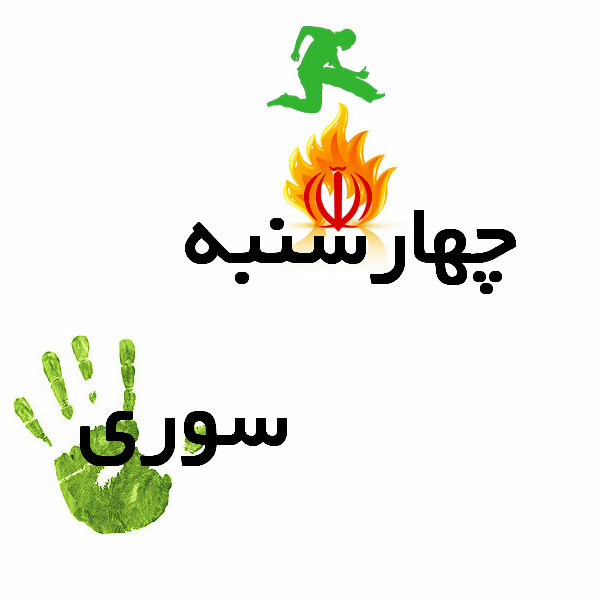 In a bid to encourage the youth to keep silence and remain inactive during the Fire Festival, the Iranian regime’s intelligence organs that oversee these actions have distributed deceptive guidelines asking the participants to be silent in order “not to give excuses to those who seek violence (the Iranian regime’s suppressive force),” “not to raise our (protesters) expectations,” and not to chant slogans targeting the foundations of the regime. 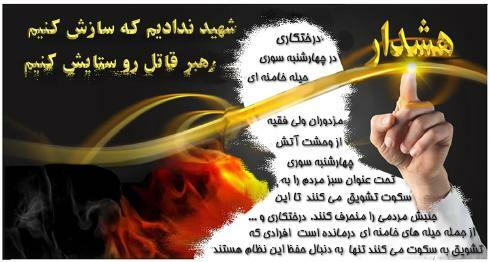 They even distributed messages calling for the “boycott of Chaharshanbe Souri” to astray and pacify the youth. After weeks of failed propaganda to portray the celebration as superstitious and contradictory to Islamic teachings, the regime recently has resorted to a new tactic of trying to highlight the so-called positive aspects of the event. By doing so the regime’s news media encourage people to refrain from having fireworks and protests and instead cook soups and observe other traditional customs. Meanwhile, the Telecommunications Company of Iran which is controlled by the Islamic Revolutionary Guard Corps (IRGC) has already started filtering the internet such that since Tuesday the lines have become very slow and disrupted. 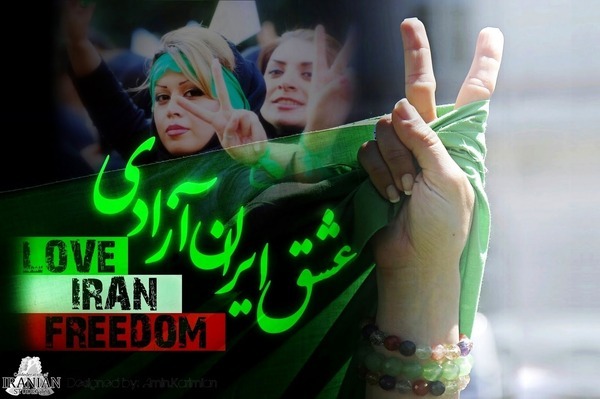 GreenVoice of Freedom — According to various reports received by GVF, a security atmosphere has become dominant in Tehran in the days leading up to the Chaharshanbe Souri celebrations on 16 March. Eyewitness reports and GVF correspondents have observed special police patrols and security forces stationed in various squares across the city. This is a sure sign that as expected, authorities have been preparing to prevent peaceful expressions of protest by the Green Movement from taking place. 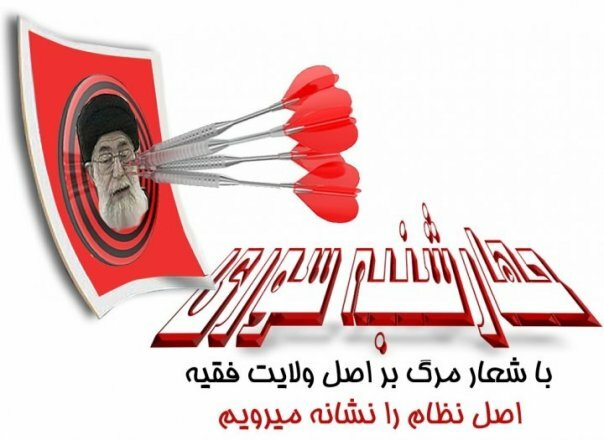 The regime has been applauding the IRGC for their successful spectacle they carried out on 22 Bahman, and praising Khamenei for his guidance since the Coup d’ etat. They wish to portray that they have defeated the opposition and all is normal again. 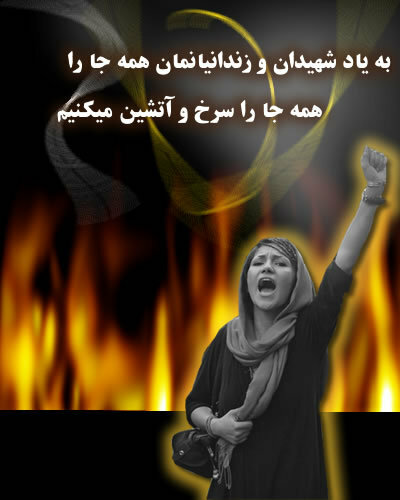 On Chaharshanbeh Suri, the opposition will show that nothing is settled, and that the struggle continues. To be present all across the country. Not massive gatherings of protestors, but smaller groups all around the cities. 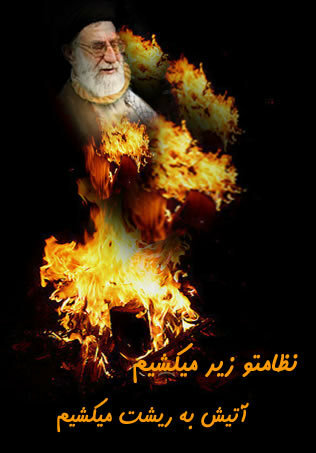 Display disobedience to the regime by burning pictures of Khamenei, Ahmadinejad, etc. and sing opposition songs such as Yare Debastani, etc. Showing unity by honking car horns, playing opposition music and yelling anti-regime/pro-oppositon slogans. Candlelight vigils to remember and honor the movements martyrs. This day is for showing unity, solidarity and the lifting of morale, while at the same time, informing the regime that the oppostion is alive and kicking. Also, to further the demoralization of security forces and keep them scrambling all night long. Ahmad-Reza Radan the Deputy Commander of the Police in Tehran has said: We have had meetings with the Islamic Revolutionary Guard Corps (IRGC) and [paramilitary] Bassij are patrolling various parts of Tehran and across the country.He also warned people against various forms of protest, including creating traffic and honking, saying: We are very sensitive with regards to the probability of streets, squares, and junctures becoming limited by vehicles and pedestrians. These people will definitely be arrested and there is coordination with the judiciary so that anyone who blocks roads would have their car confiscated during the holidays. Certainly there are not a lot of these kinds of people.